Thank you for sharing your perfect storry! After that we went to favourite fan's café "Puzata Hata". This café is a legend. They should rename it to . Ruslana's concert was just amazing, it was Great Grand Show. Ruslana sang songs from different albums: Amazon, WE, WD, the song "Svitanok", and Ukrainian folk songs. I can immagine. I'm happy for you! Maybe she's getting ready for her new project which will again be bassed on Hutsulian culture by singing theese folk songs? you are welcome, there are also photos in the Ukr. topic about The Independence Day in Lviv. Maybe she's getting ready for her new project which will again be bassed on Hutsulian culture by singing theese folk songs? You never know. I heard that next project will be based on songs with folk structure, but you never know, only Ruslana knows it. I read that alexned will be in Odesa, I can call to Kvita, and she will meet, and they all will be togetther. But I need to know when alexned will arrive to Odesa? You have to tell me when and where you will arrive, and a new president of fan club will meet you. What is your name? When you give more info. about your arrival, then it is possible to get in touch with you and meet you. I can call to Kvita, and she will meet, and they all will be togetther. Good idea, if he wants. The concert in Odessa will take place at Potemkin Stairs aprx. at 19:00. It is all that I know at this moment. Yes, of course, it will depend on him. Does Kvita speak English? Will you be there to help with this? Or someone else? Or meay be alexned speaks Ukrainian? No, Kvita does not speak English, I won't be present there, so I can translate some info over the phone. It's a "City Day" which sounds like a free event on a big market square. Thank you...again (this year, again)! It will be my pleasure, for sure! But, I hope that some of you will be there, too! However, I know that my English is not so good! And it is ineffective in... what? You are talking about music here...and about great shows (Ruslana concerts are so great, believe me)...If I remembered well! Nothing else! Thanks for response, anyway! I will be... there! Be sure! I whish to do do more regarding that! She is really wonderfull! Yes, but you have to tell your name and are you already in Ukraine or you are still in your country? Because there will be too crowded. When you are in Ukraine you can call me, my cell number is: 80685155605. You are welcome to call anytime. To my regret I won't be present there, I was in Lviv, but when you give me enough information about yourself, and where you will wait, they will find or meet you there. Do not worry about your English, we will figure something out. 2-nd of September is close now. I do not have any news from you. If you want to come to the concert and to meet Ruslana, you have to write here or to call, so in that way you can get in touch with the fans who will be present in Odessa. I will start from Romania this night! Unfortunately, I cannot enter to Ukraine from the South-East! 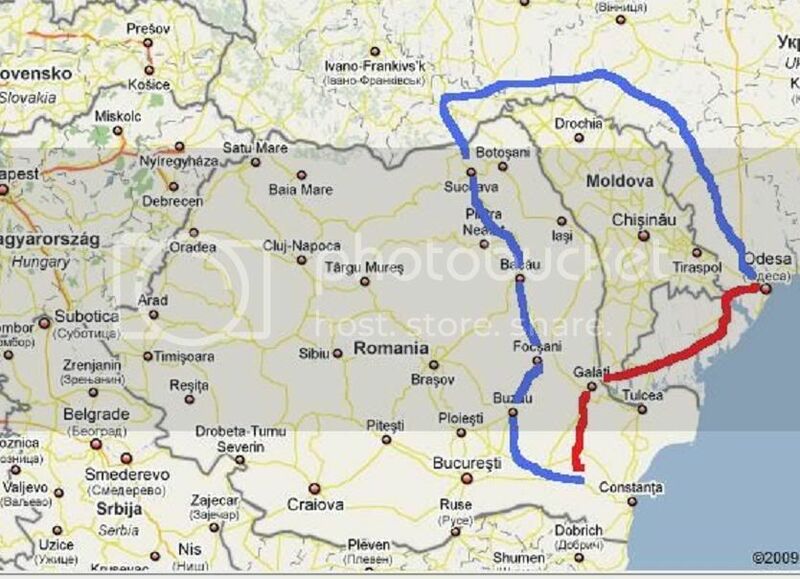 So, I will have to drive in long time rounds (the blue route)! But I hope that I will be in Odessa on 2 September at midday! Thank you for the cell number! I will call you after I will arrive in Odessa!I do not know the place of the show! The concert in Odessa will take place at Potemkin Stairs aprx. at 19:00. I do not know the place of the show! I have talked with her. She can meet you and then you with others fans will go to the concert. At exactly 08:21 I saw that signpost that says: Odesa! After a journey of nightmare! Especially the car suffered a lot! Unfortunately, I have to repeat this experience at return! She can meet you and then you with others fans will go to the concert. I accomodated at Palladium Hotel and, in the next few hours I will be sleeping! Cos I have not sleep even for a second, from 31,08,2009 06:30 a.m! Just driving! I am a kind of ZOMBI now! In order to do not affect the schedule of other fans I will prefer to meet them all exactly at the place of the show! I already found the place of the show (from the reception staff)! Close enough! Easy to go there! Thank you once again for help regarding the concert! Oh, I know, what it means to drive for a long time. Ok, have a good rest and of course I hope you will get some sleep. It is good that the place of the concert is not too far. Of course it is good idea to meet fans at the place of the show. You will be able to find them near the stage, or they will be present soon at the sound-check, if not now, so you will be able to meet them before the concert. They supposed to wear T-shirts of Ruslana, it is easy to find them. But of course I will call to Kvita, Ukrainian president of fan-club, or you can call me. Have a nice time and enjoy Ruslana's Grand Show. I hope you will read this message. I learned that Ruslana would perform at 6 o'clock. You have to hurry. There won't be any fan zone, so the fans will be with all the audience together. But they will be glad to meet you and to spend time together. Good luck, I hope you will arrive in time for the show. Anyway it a good idea that visited Odesa on the City Day! Olena SoltysyakalexnedI hope you will read this message. I learned that Ruslana would perform at 6 o'clock. You have to hurry. There won't be any fan zone, so the fans will be with all the audience together. But they will be glad to meet you and to spend time together. Good luck, I hope you will arrive in time for the show. Thank you for all support! But, unfortunately, this is the moment when I'm reading your message (15:56/03.09.2008) for the first time, on a Internet Cafe computer, in Odessa! I've arrived at the Potemkin Stairs at 18:15! I thought that I will have enough time to meat Ruslana fans and to enjoy her show! But, bad surprise: I immediately saw Ruslana... already singing, on two big screens installed outside of the show area! In the first moment I hoped that this is an advertising only, for the show that has to come!But ...No!And no chance to pass through out the group of policemen that stopped the access to the "stairs" area! I really do not know when the show started, but it ended at 18:30! I watched Ruslana on the big screens performing the last 2 songs!But the sound was almost nonexistent in that location due to the huge distance towards the stage! I've recorded about 2 minutes of what could be seen on the screens! I am a little bit dissapointed, but It is only my fault cos I didn't contact Kvita in advance! Thank you for trying to help me! I am very sorry what had happened. When there are concerts like those, it is always overcrowded. The show was supposed to start at 18:00, I called to Kvita at 17:00, and she told me that. It is very frustrating, that you could not see the whole Ruslana's performance. Sorry for asking, but for how long are you going to stay in Ukraine, if long enough, you can see other Ruslana's performance in Ukraine. Sorry, I hope you will be able to see Ruslana's performance alive. I came here just for this concert! I will go back home tomorrow! I came here just for this concert! I will go back home tommorow! Oh, no. It is very dissapoited. You drove all the way down to Odessa to see performance, and you did not make it. Oh, man. I am really sorry. Where are you from? Can you come again to Ukraine? there supposed to be concerts during autumn time. Can you come then? For example, when I will know the date of the concert we can contact each other and you wil be able to come and see the show. The concert was supposed to start at 19:00, and then the time was chenged. and Ruslana performed earlier too. I really do not know why and what was the reason of that changes, I know only that the president had to be there too. In the first moment I hoped that this is an advertising only, for the show that has to come!But ...No! Oh no, I am really sorry for you! What a sad story. A lot of kilometers I think that blue route. What a pity. I hope you will have another chance to meet Ruslana. I am really sorry for this sad story.